Fifty of the world’s most important buildings seen through specially commissioned isometric illustrations and detailed photographs and plans, providing the perfect introduction to architecture for students and anyone interested in buildings. John Zukowsky is an architectural and design historian with more than four decades of experience. While curator of architecture for the Art Institute of Chicago from 1978 to 2004, he organized a number of award-winning exhibitions accompanied by major books. He has recently authored Building Chicago: The Architectural Masterworks. Robbie Polley is an architectural illustrator with more than twenty-five years of experience. His drawings have been featured in thirty books. "A revealing new book rethinks the architecture tome—from the inside out...a tour de force... which seamlessly merges the visual and the written." "The author John Zukowsky and illustrator Rob Polley take a look at 50 famous structures in detail including amazing axonometric drawings showing how they were constructed." "Thoroughly 'reader friendly' in tone, commentary, organization and presentation, "Architecture Inside-Out: Understanding How Buildings Work" is extraordinarily informative and will prove to be an enduringly popular and unreservedly recommended addition to personal, professional, community and academic library Architectural History collections and supplemental studies reading lists." 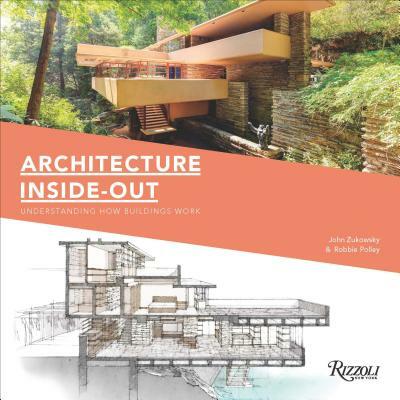 "A perfect introduction for how buildings work, with anecdotal prose and excellent drawings."